As Taylor Sheridan’s third produced script – and his directorial debut to boot – Wind River completes the virtuoso writer’s three-piece reinvention of the modern Western. It’s not just the look of these pictures or the content that feels particularly fresh, but more so the brutal worlds in which he exposes particular pieces of human nature. In Sicario, his story shone a light on the seemingly unwinnable war against Mexican drug cartels, how the fight must continue to be waged, and how it’s now a part of their society. Hell or High Water crosses the border into West Texas while following two bank-robbing brothers trying to hurt the system that’s left their way of life bankrupt. And in Wind River we travel even farther North to the frozen tundra of Wyoming. The film’s theme seems to revolve around well-meaning yet incompetent outsiders trying to dictate the lives of locals and Natives. Its condemnation of unnecessary oversight is damning, harsh, and explosive. The unneeded eyes belong to rookie FBI agent Jane Banner (Elizabeth Olsen). That she has to borrow proper clothes immediately after stepping foot on to the Reseervation should say it all, like a high school student taking the SAT for the first time without a TI-83 calculator (is that still the model they use?) or even a sharpened pencil. Local officer Ben (Graham Greene) knows that he can’t overstep her command, and so he begrudgingly shows her about. The investigation concerns an 18-year-old woman named Natalie (Kelsey Asbille) found frozen to death in the snow, her head lacerated, both feet frostbitten past ankle high. She was found by Wildlife agent Cory Lambert (Jeremy Renner), a man who we come to learn has emotional stakes with a loss like this. He’s a tracker and a hunter, both of which he promises to do for Martin (Gil Birmingham), father of the deceased. The plot of the film itself has a lot of similarities to Jane Campion’s first season of the show Top of the Lake. A fish out of water comes in to investigate the mysterious disappearance of a girl, the locals have their secrets, and the reveal twists knots in our stomach. But there’s also an element to this story that feels a bit like the heartbreaking 2007 film In the Valley of Elah. Both movies emphasize, with a sincerely moving effect, the weight placed upon the shoulders of parents after their child is no longer physically theirs. Lambert attempts to console Martin, and while doing so he says, “If you shy from the pain of it, then you rob yourself of every memory of her, my friend. Every one.” Wind River’s heart can be found in these soft-spoken words. The anguish is as authentic as these people in this world. Led by some fine performances from Olsen and Renner plus a score sounding like a chamber choir, Sheridan’s assured direction keeps in tune with his previous work, building tension through secrecy and continually escalates the stakes with masterful dialogue. He simply understands how to craft conversations full of uniquely spoken words. Perhaps even more importantly, he translates the way his characters think into actions. Case in point: when Lambert answers the phone saying, “yeah” and the camera immediately cuts to his truck pulling a u-turn on the highway, we get to see what the brilliance of brevity looks like. Less can often speak volumes more. For a film about uncovering the demons in the tracks of such heinous acts, setting the story out in a vast snowscape not only makes sense on a logical level, but on a symbolic one as well. 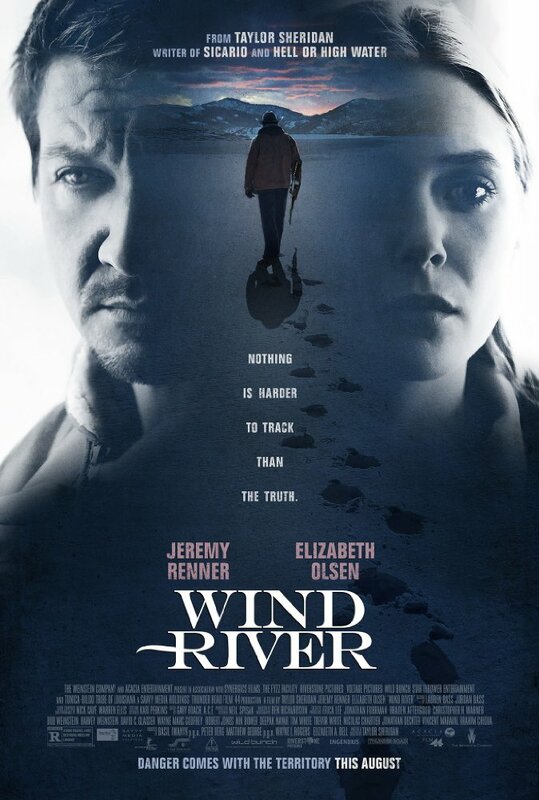 Wind River might hold its cards too closely to its chest for too long and loiter around too aimlessly, but if those bits are contributing factors towards the ultimate showdown, we need to take it with a grain of salt knowing full well that bullets will fly and blood will be spattered. And that the snow will cover this film’s own tracks, that the events will someday happen again. 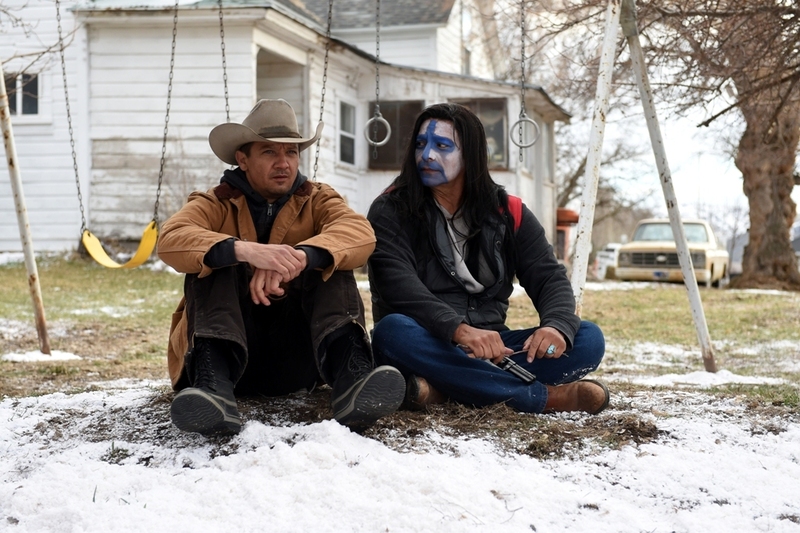 Sheridan’s movies have a certain level of a pessimistic worldview to them in this regard, but Wind River is his latest example that the search for positivity is worthwhile even if it can just as easily drift towards foolish hopefulness.